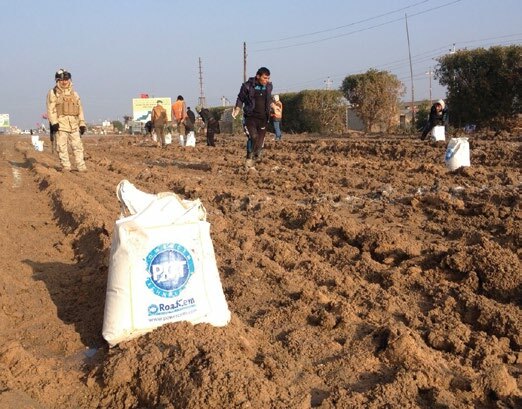 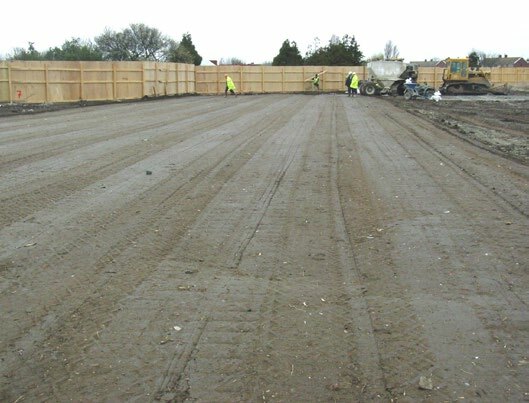 In a areas with highly organic soil as well as a high ground water table, a stabilization was realized by using RoadCem. 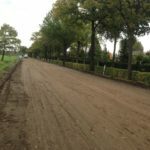 On top of the RoadCem layer an asphalt wearing course was applied. 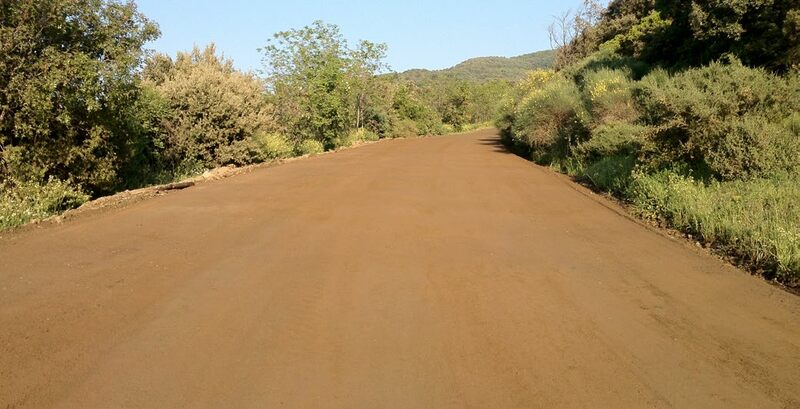 The results were as expected, strong, fast and durable, to the satisfaction of the client. 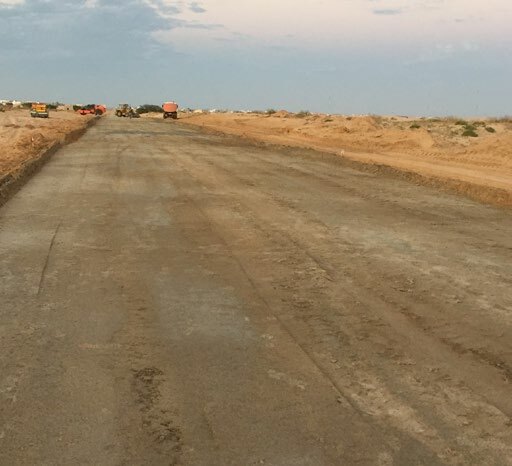 The capital of Mauritania is growing and the traffic has multiplied much in the last years. 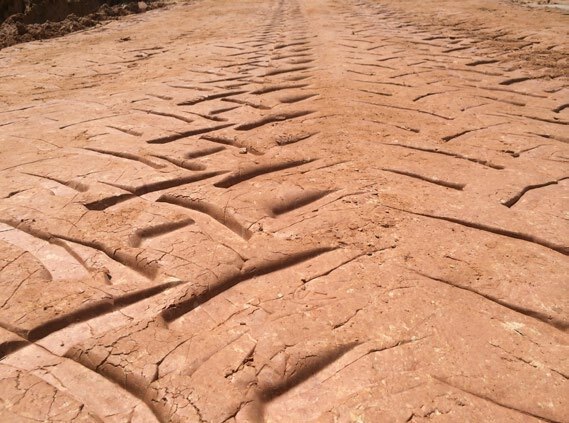 Except for a few thorough fares most streets in the city are unpaved. 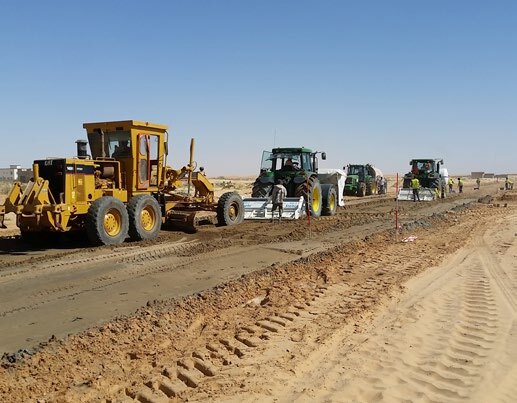 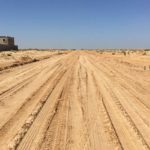 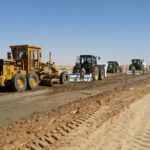 The government of Mauritania was looking for a solution to make new sustainable roads for the developing of new districts, and an effective way to pave the existing sand roads in the city. 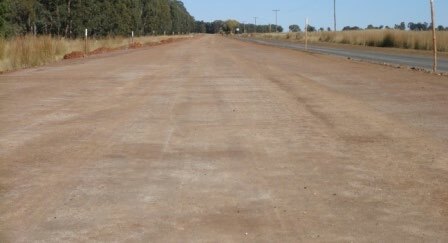 The main road was build using RoadCem. 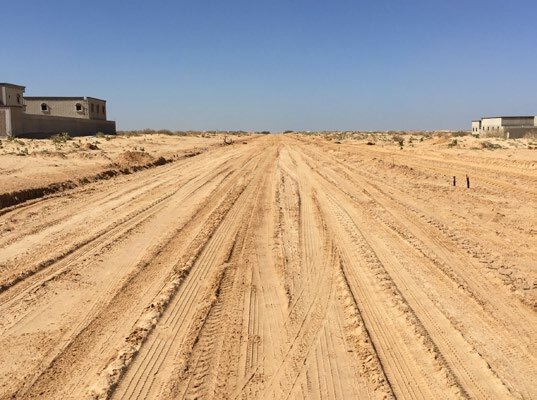 The road is situated through sand dunes of the desert and salty Sabcha, swampy areas. 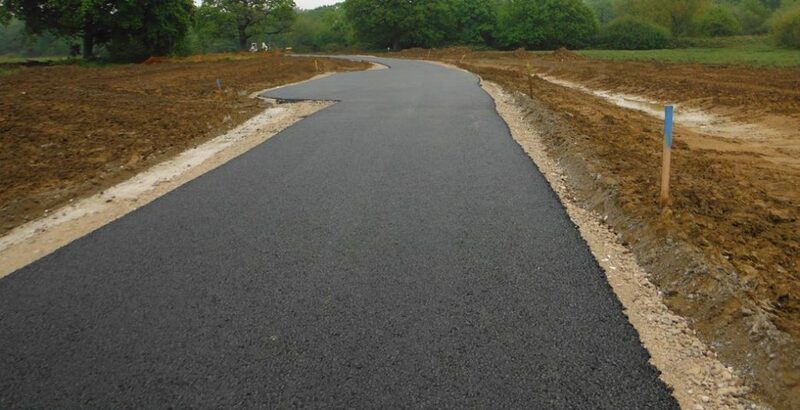 RoadCem was chosen as it was very effective to make new roads. 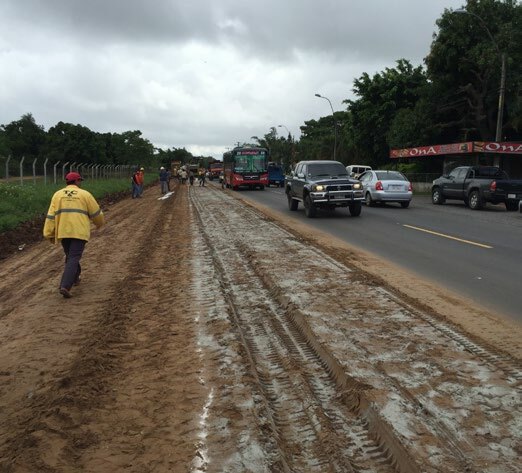 The new pavement support the construction traffic needed to develop the new district. 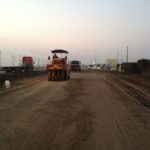 This means heavy traffic is expected and will grow significantly for the coming years. 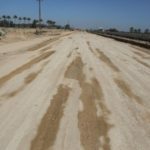 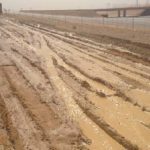 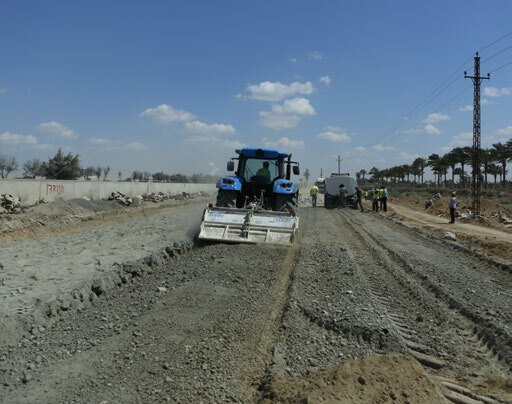 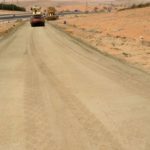 To increase the capacity of the highway between Alexandria and Cairo, a security road was built. 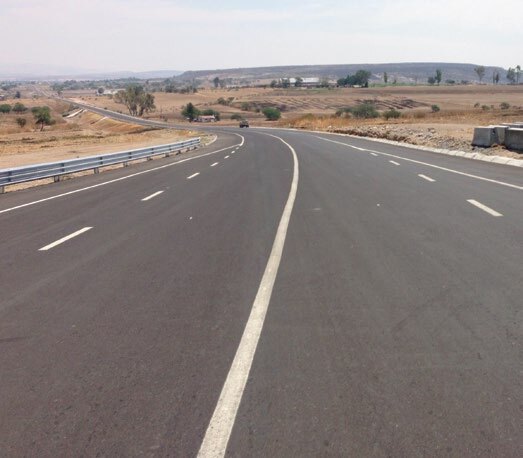 The highway is very important because it connects the two biggest cities of Egypt. 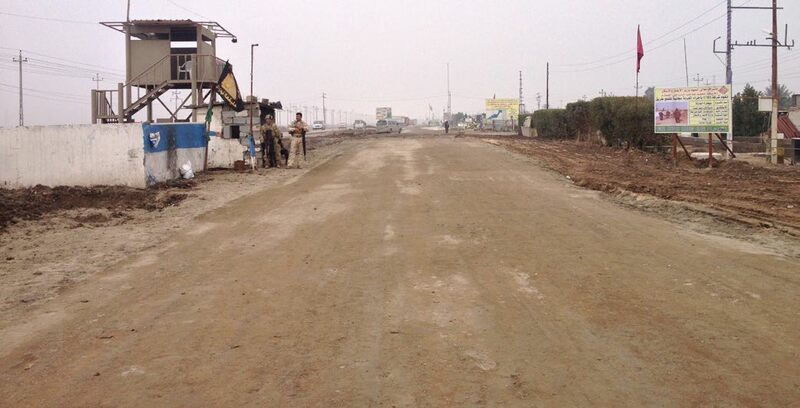 Therefor the traffic flow has priority and construction works should not cause any hindrance. 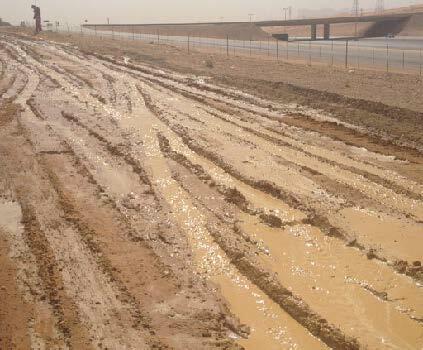 The new security road has to guarantee the traffic flow in case of traffic jams on the highway. 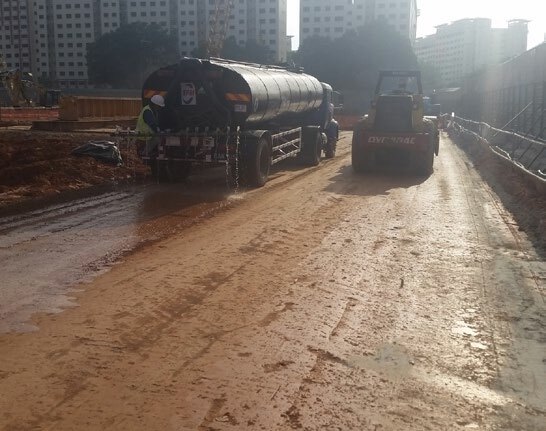 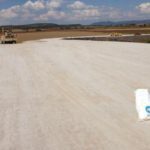 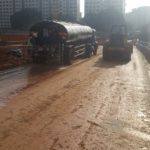 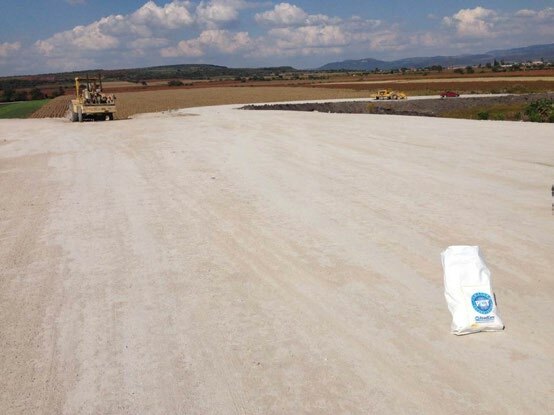 RoadCem was the solution as an efficient construction method resulting in a high quality road,easily connected to the existing sections. 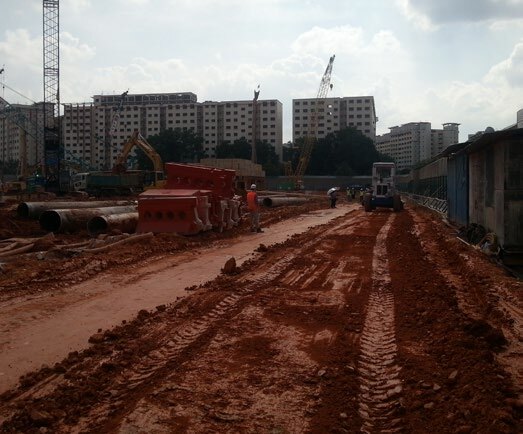 Singapore is a country with limited resources for construction materials. 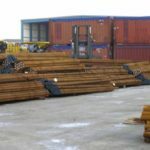 Primary construction materials are scares and become more and more expensive. 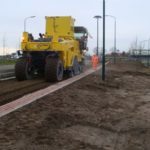 In line with this a big developing company for social livings invested in a platform for innovations in the construction business. 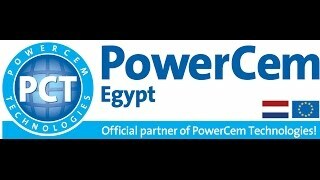 RoadCem was selected as the best innovation and introduced in the project. 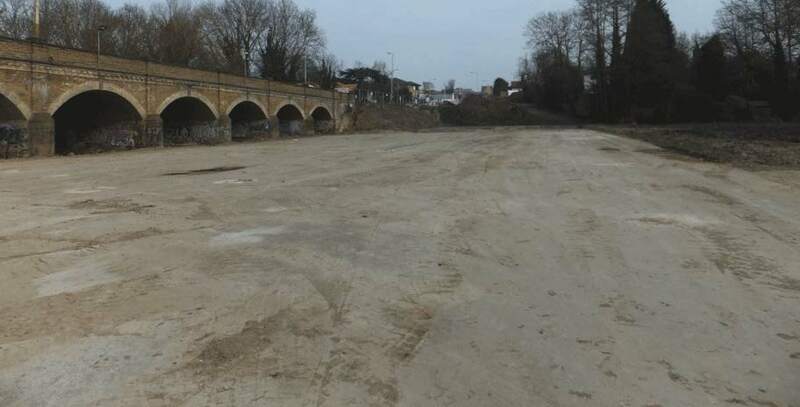 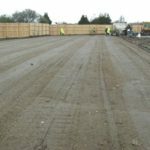 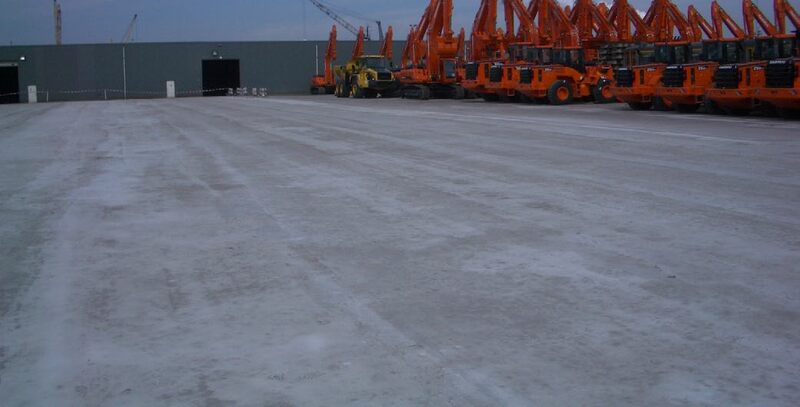 RoadCem was used for a temporary construction floor during the piling works of the new housing complex. 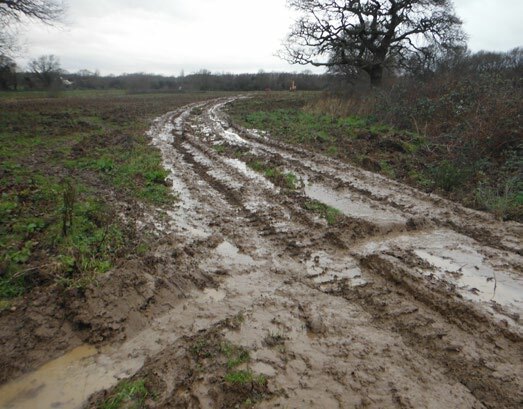 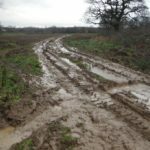 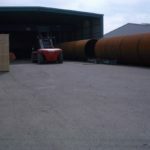 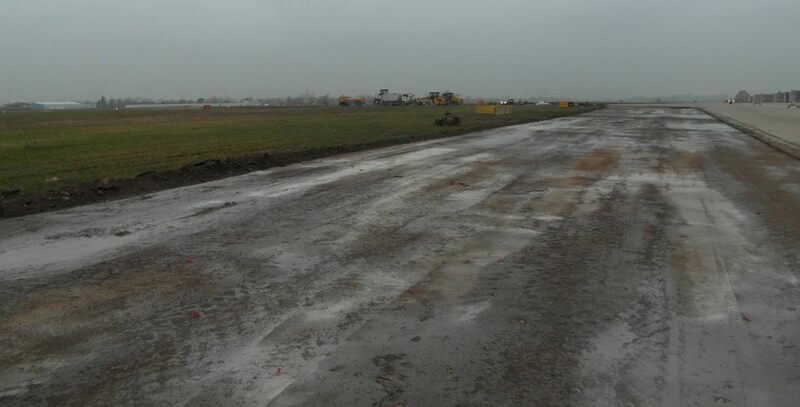 Due to the low bearing capacity of the high plastic clays, the area was only accessible for track based vehicles. 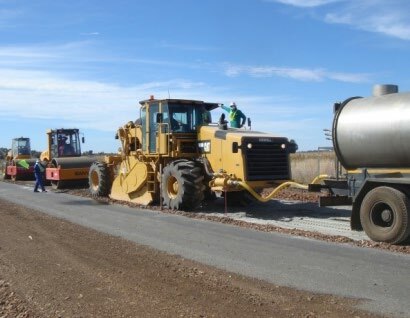 The RoadCem stabilization was intended to be part of the new access roads and parking lots. 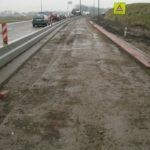 The significant reduction of construction traffic was one of the most important topics for this CO2 conscious country. 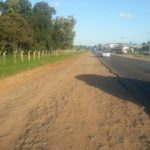 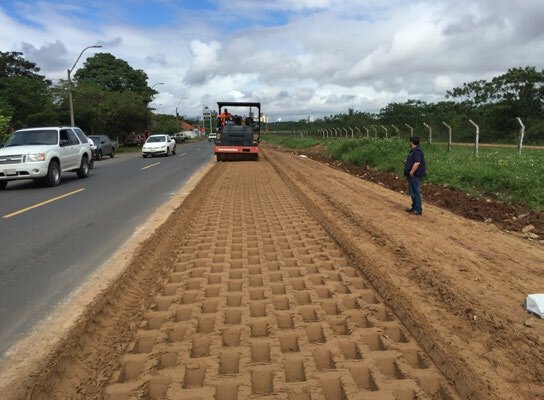 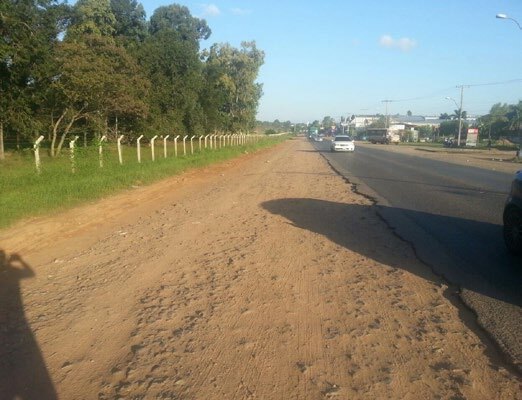 The traffic intensity on the roads of the Paraguayan capital Asuncion is high and the government choose RoadCem for a durable and sustainable solution as well as to minimize the traffic hindrance. 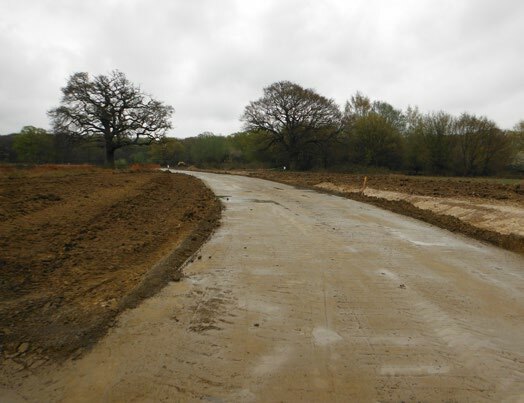 Whilst the traffic continued over the existing road both shoulders were stabilized with the in-situ soil to get a wider road profile. 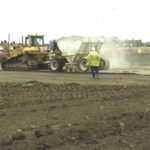 A layer of asphalt will be brought on top. 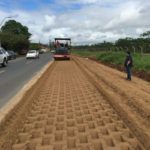 This ecological solution saves both the environment and is to the benefit of its users in the broadest sense. 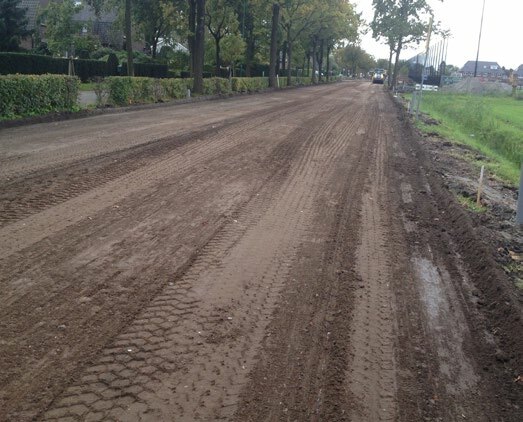 In Utrecht the N227 was completely reconstructed with RoadCem. 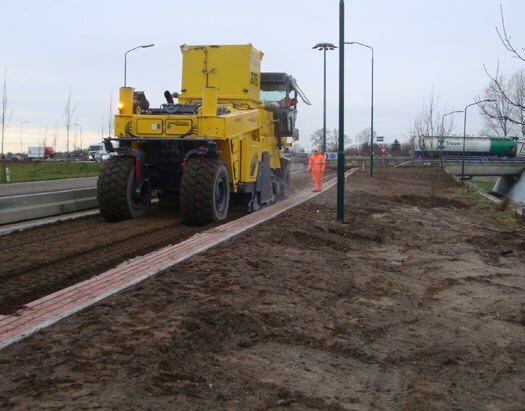 The project was commissioned by the province of Utrecht and the design was developed in collaboration with ARCADIS. 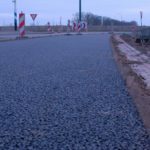 The existing road structure was a rubble foundation with an asphalt coating. 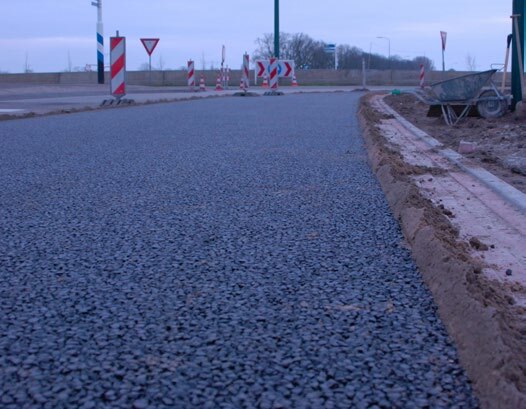 By using RoadCem the existing pavement material was reused in the new design. 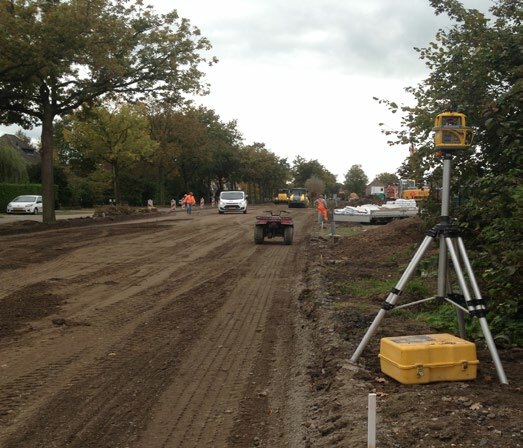 RoadCem has led to a significant cost and construction time reduction. 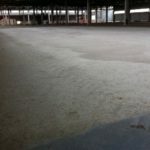 In addition limited re-use of materials didn’t impact the environment. 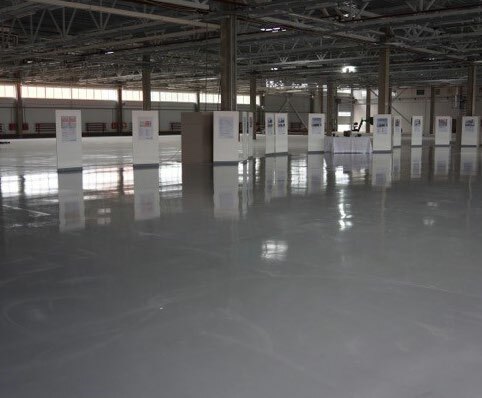 In Saint Petersburg a warehouse was built, situated on a landfill area next to the city. 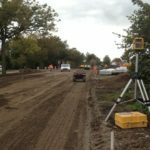 RoadCem stabilization has earned a solid reputation, and the client was keen to use the technology. 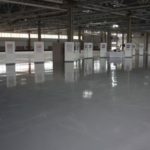 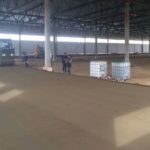 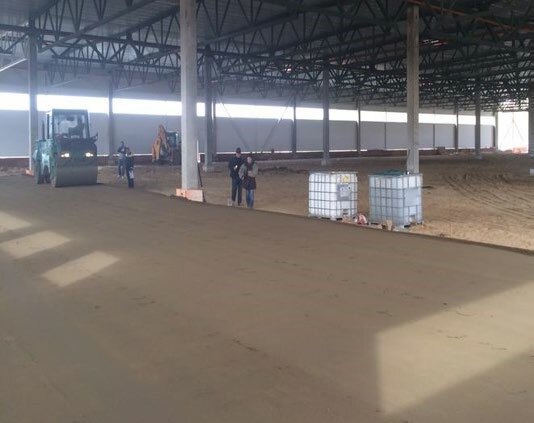 The warehouse floor was made with a RoadCem stabilisation finished with a concrete top-layer to bear the intensive warehouse activities. 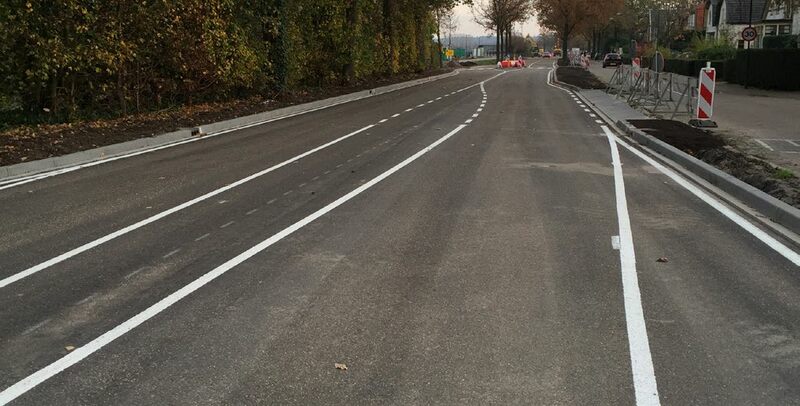 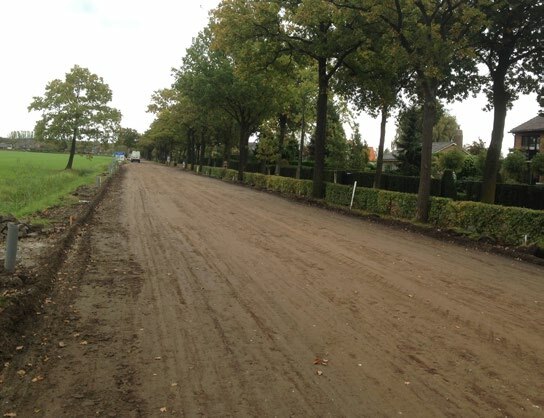 The outdoor terrain was made with a RoadCem stabilisation finished with an asphalt surface layer. 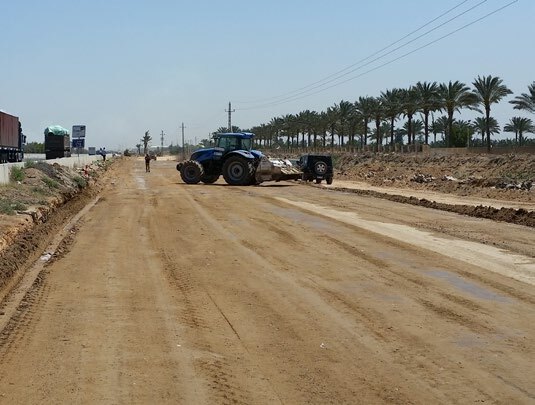 The Iraqi government invited PowerCem Technologies to introduce RoadCem for its application in safe and long-lasting infrastructures. 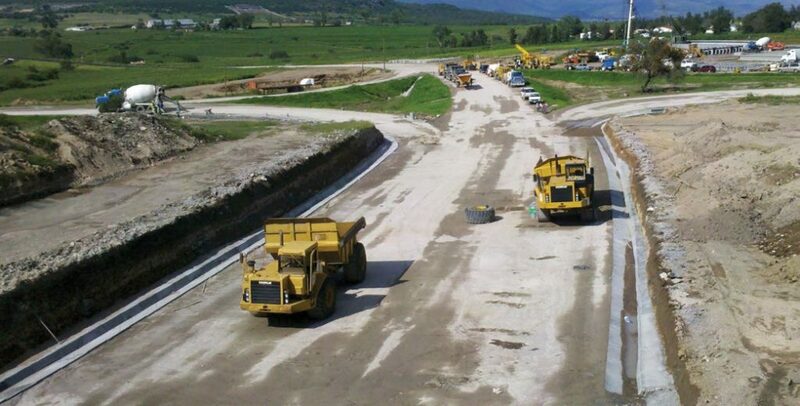 In this project construction time was an essencial factor for the decision to use RoadCem. 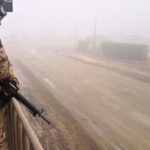 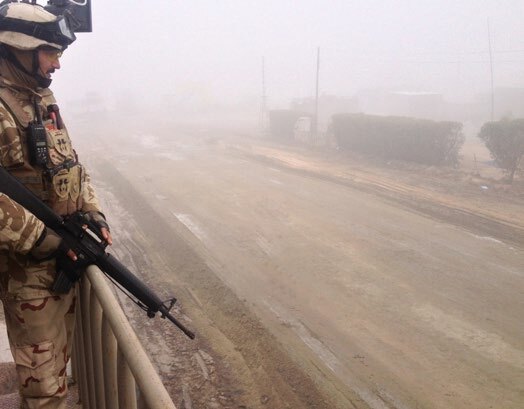 Due to the security risk in Iraq execution was done under heavy military guard. 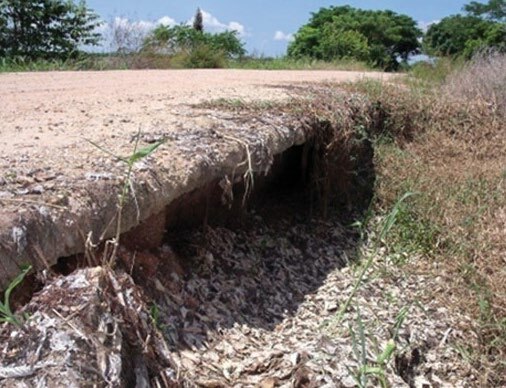 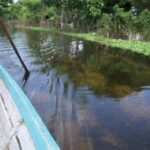 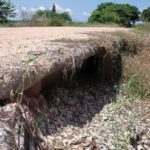 In Urucu in the Amazon region, roads are subjected to extreme forces as a result of heavy lorries, the relative weakness of the clay layer and the extreme weather conditions. 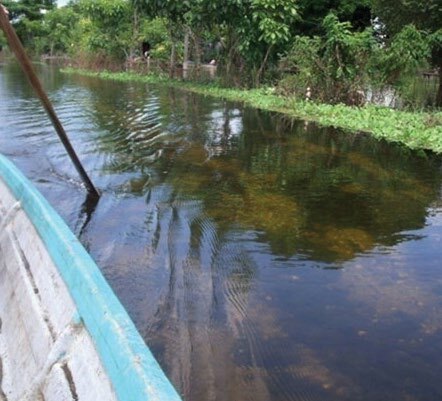 Working conditions in the Amazon region are challenging. 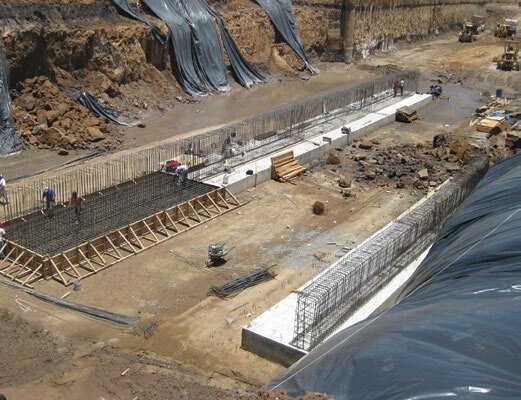 As it is impossible to estimate when downpours will occur, it is important that a quick construction method is used. 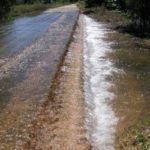 This minimizes time loss due to saturation after heavy rainfall. 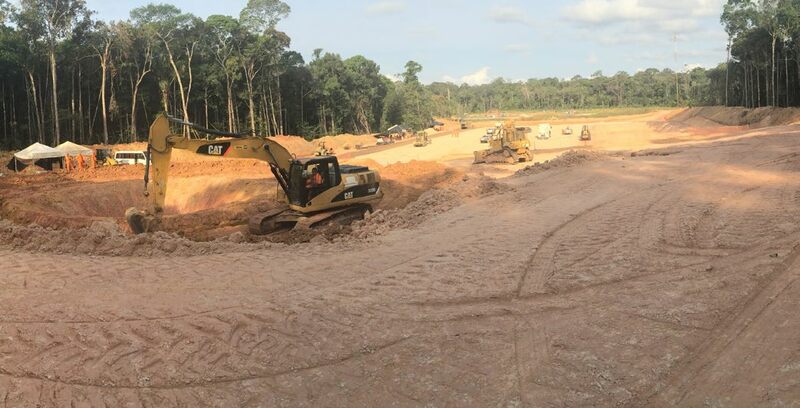 In the Amazon region, it is important that applied constructions, have as little impact on the ecosystem as possible. 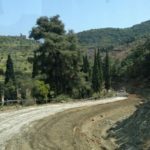 In addition, the ground upon which the road is constructed must be able to reforest at the end of the road’s operational lifetime. 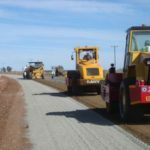 Using RoadCem stabilization fulfils all of these vital preconditions. 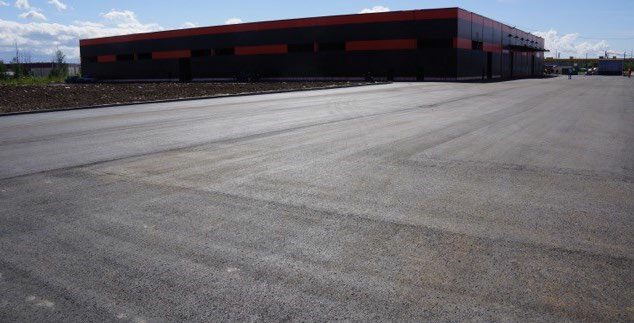 And in addition to being 30% cheaper, the quality of the surfacing was higher and the construction time was significantly reduced. 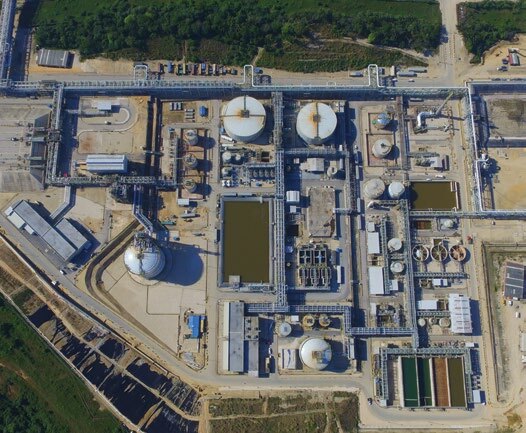 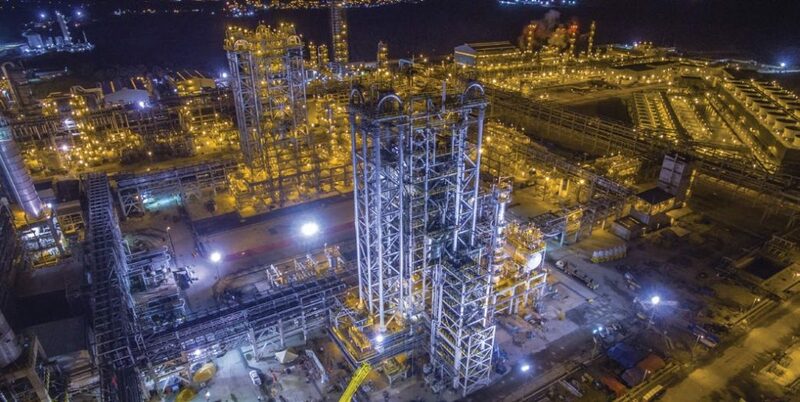 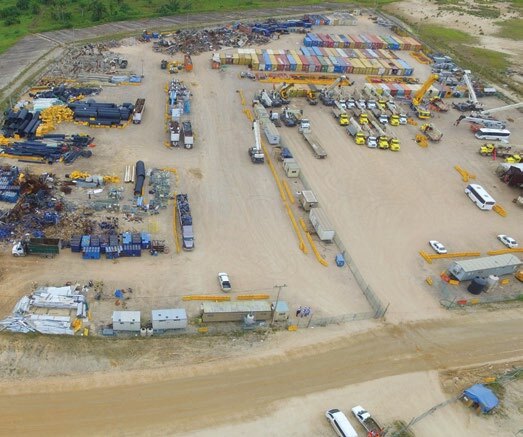 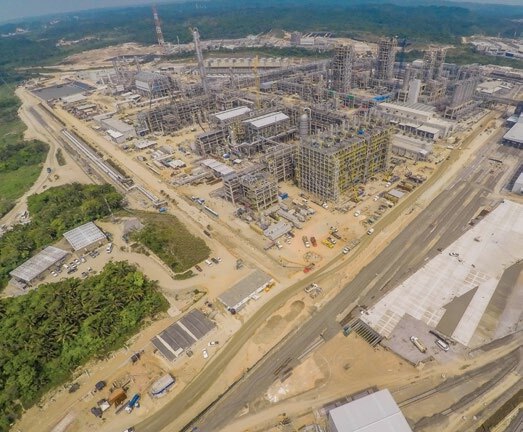 Located around the petrochemical industrial zone in the port city of Coatzacoalcos in the state of Veracruz. 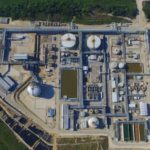 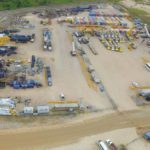 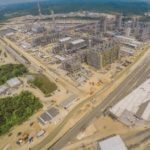 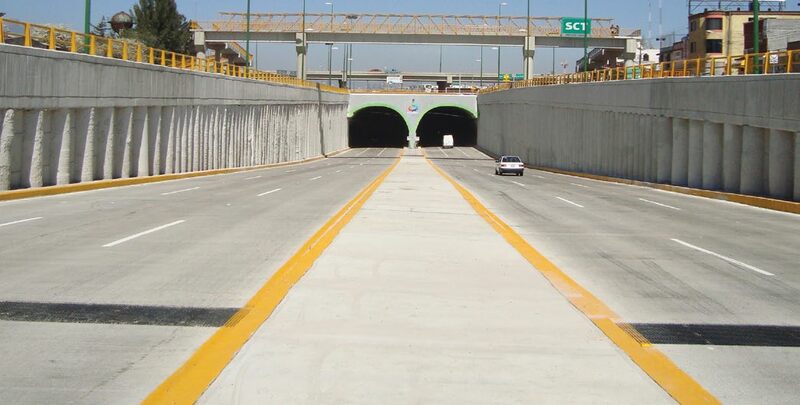 Accessed from the Coatzacoalcos – Villahermosa highway, 6,21 miles, in front of the “La Cangrejera” petrochemical facility. 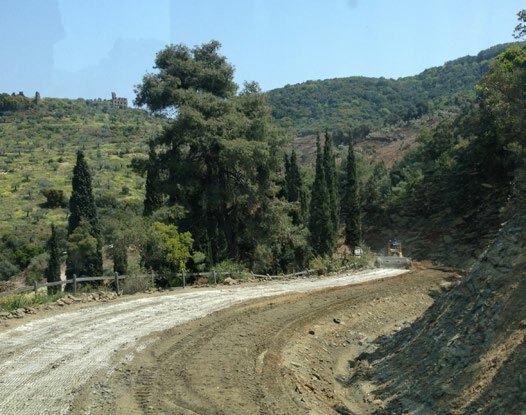 On the Holy Peninsula of Athos, PowerCem had been requested to use their technology for the roads near the Vatopedi Monastery. 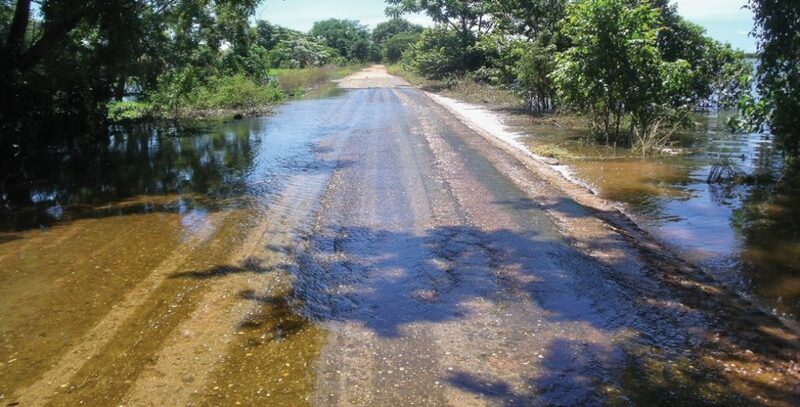 The monasteries on the peninsula are not connected via roads with the mainland. 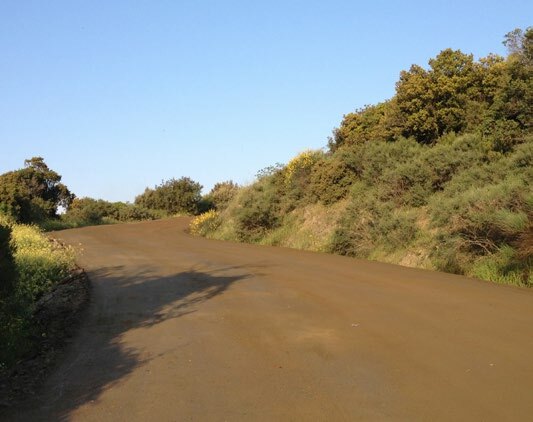 The existing road consists of gravel road, which leads to intensive maintenance, due to specific climate and soil conditions. 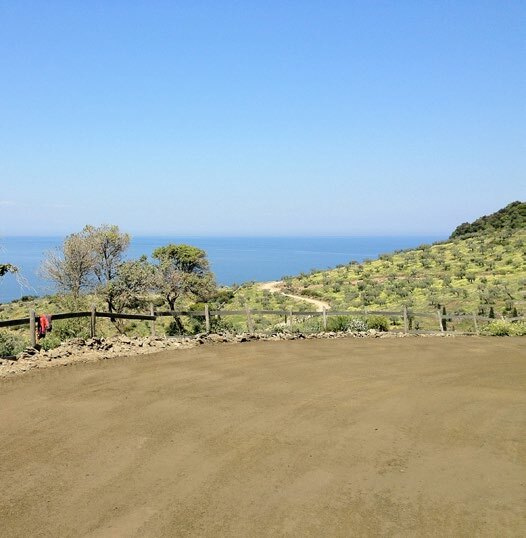 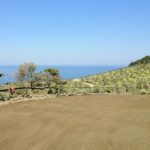 The Monastery choose to use RoadCem because its ability to stabilize soil with natural components in such a way that the in-situ Athos soil would be used. 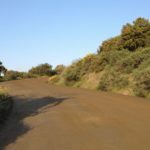 This lead to a road construction that was in harmony with the nature on the Holy Peninsula. 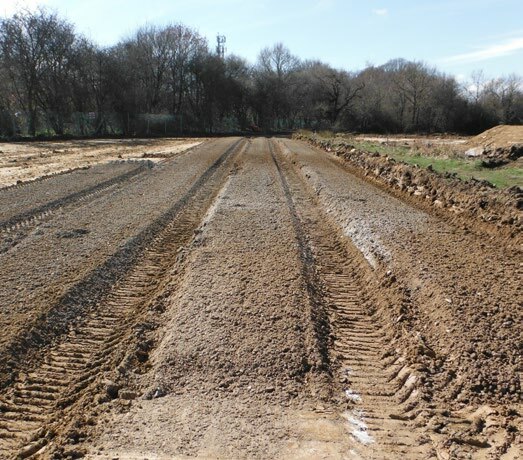 All soils found on the construction site, including organic top soils can be stabilized by the use of RoadCem. 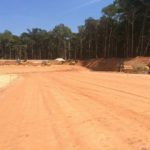 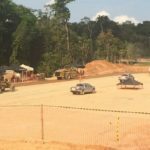 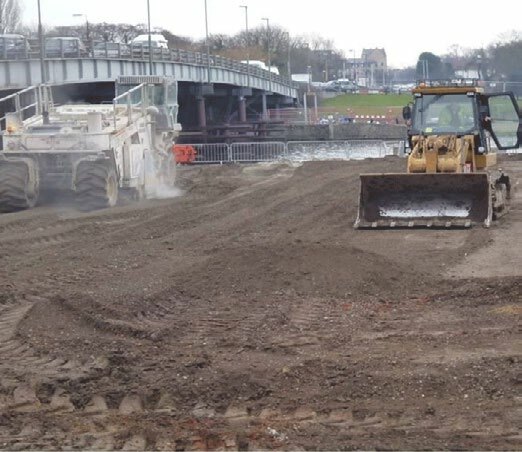 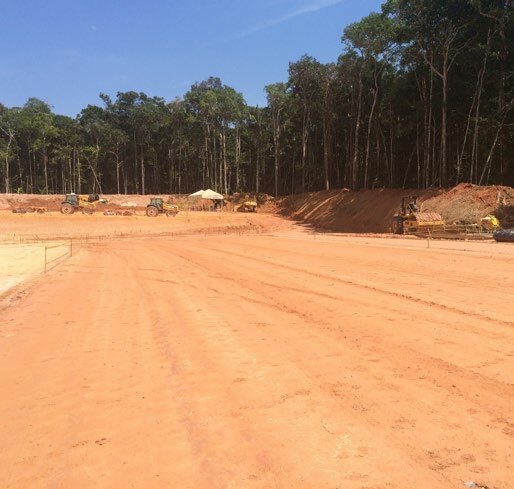 The use of in situ soils and materials had major sustainability benefits in this project; reductions in the extraction of primary aggregates and the costly exercise of land filling excavated site waste. 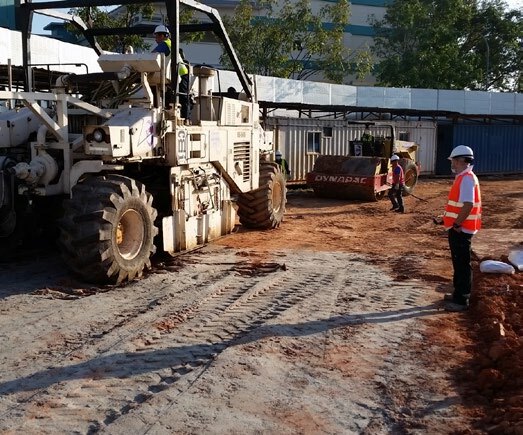 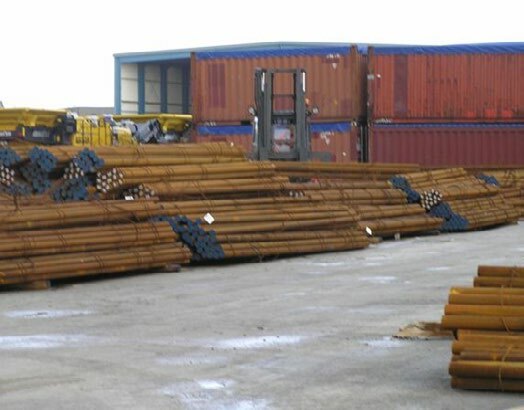 The working platform provided a safe and sufficient durable working surface on which trucks and construction plant, such as piling rigs and cranes could operate safely. 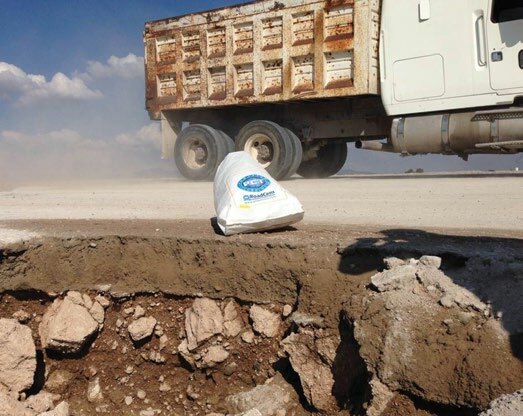 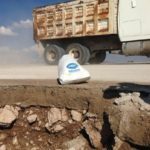 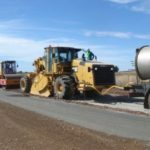 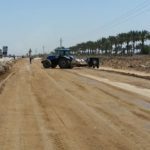 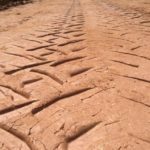 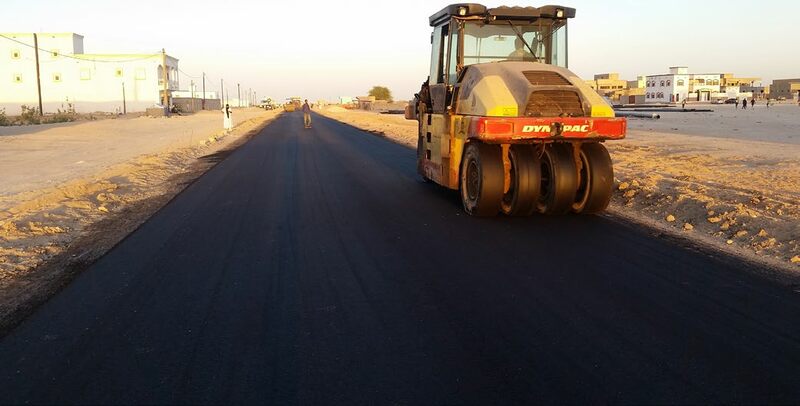 When laying pavements in the desert, there are a number of important points which have a significant influence on the service life of the construction. 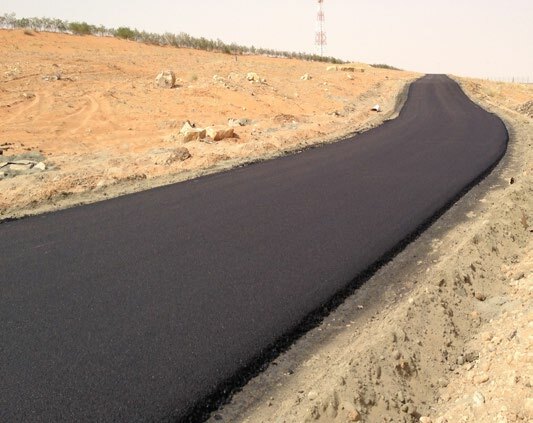 The extremely high temperatures during the day and low temperatures at night result in high stresses on road materials. 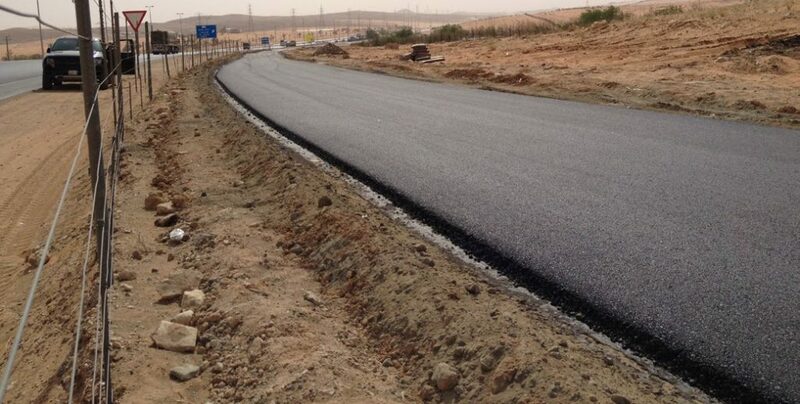 The “Ministry of Transport” in Saudi Arabia chose RoadCem for the execution of a project between Riyadh and Mecca. 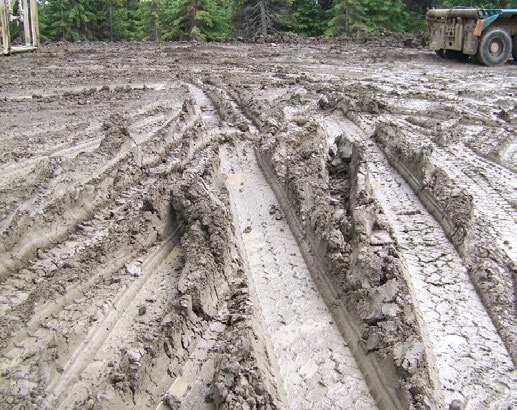 In this area, natural resources are scarce and desert sand is traditionally difficult to stabilize. 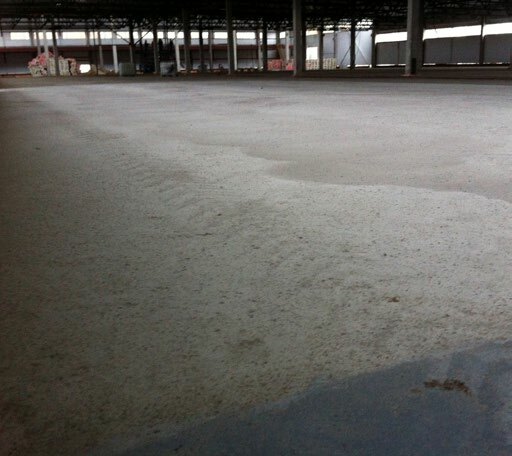 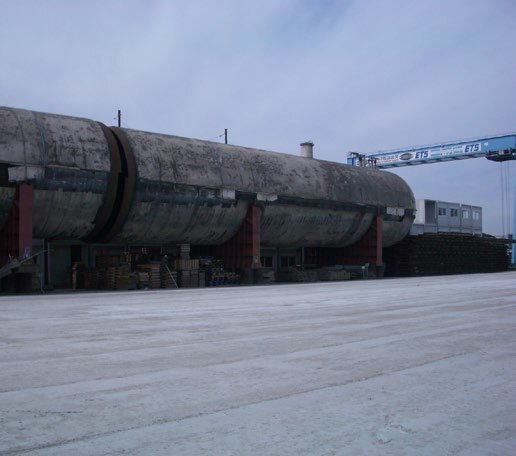 It was successfully stabilized with RoadCem and used as a durable foundation. 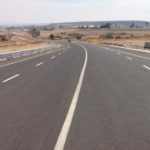 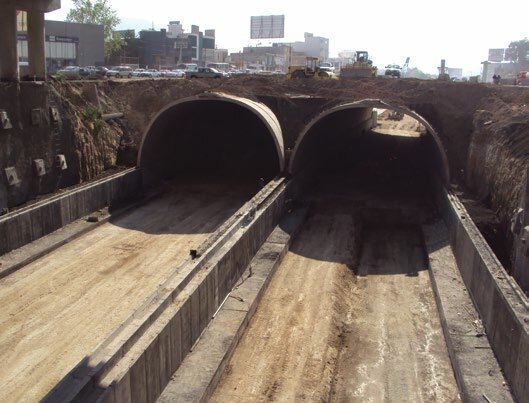 This project carried out for the “Ministry of Communications and Transport” (SCT) consisted in the Construction of the Irapuato and Numaran junctions, located in the Penjamo, Guanajuato, and La Piedad municipalities, in Michoacan, in the Center-West region of Mexico. 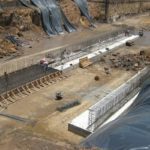 For this project, RoadCem was used to conform the highway base, significantly improving construction costs and times, with a better service life expectancy. 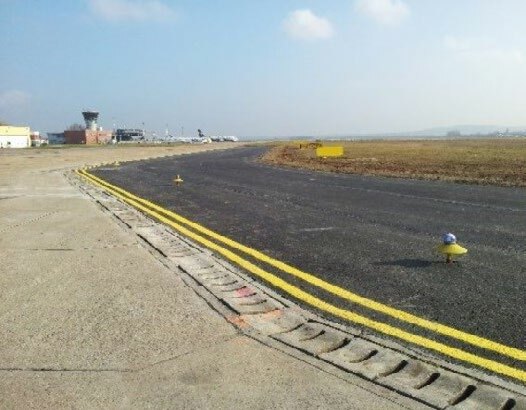 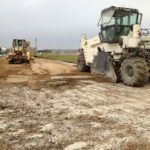 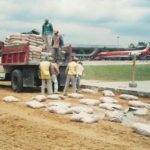 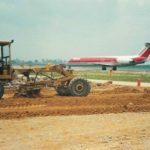 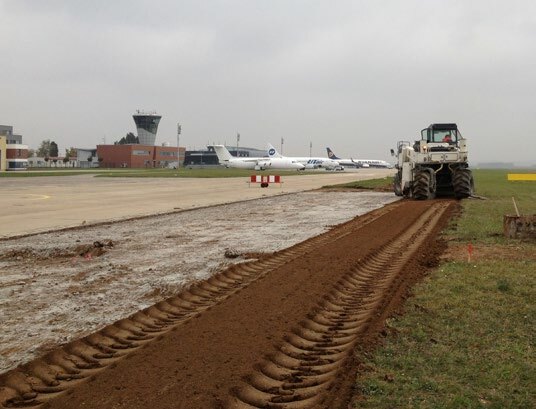 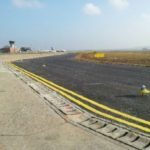 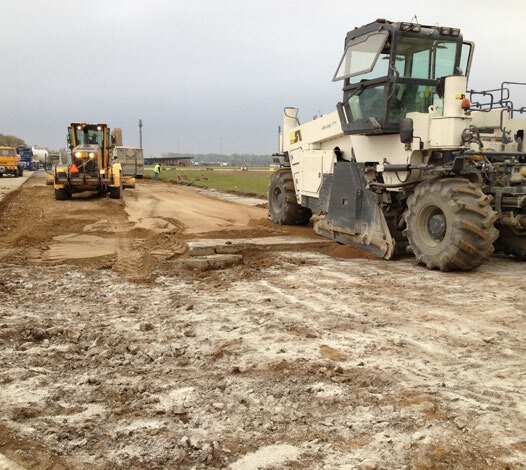 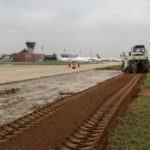 Due to the increase in air traffic and the size of the airplanes utilizing the airport, one of the taxiways at the Brno Airport had to be widened. 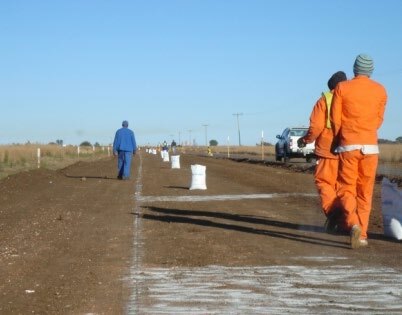 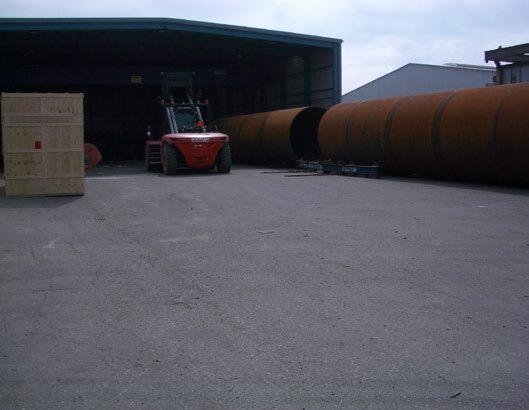 RoadCem made it possible that the supply and removal of construction materials was kept to a minimum and the amount of traffic caused by construction needs was drastically limited. 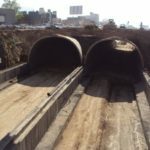 The utilization of the in-situ material not only resulted in time-savings, but a cost-saving of 25% in comparison with traditional construction methods was also achieved. 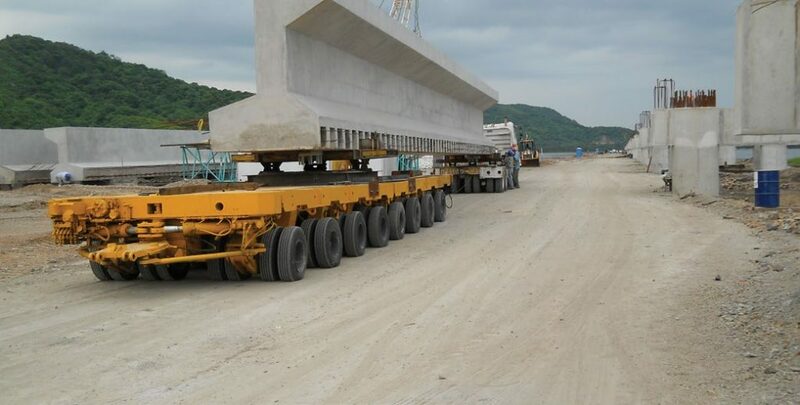 This project was regarded as special given its size. 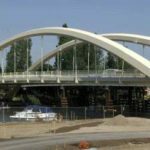 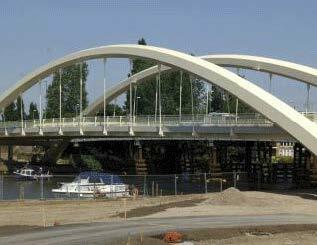 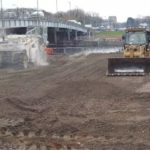 RoadCem was employed in the construction of 2,98 miles of an access bridge over the lagoon through which heavy load vehicles and 500-ton cranes can pass carrying assembled concrete pre-manufactured pieces of up to 300 tons. 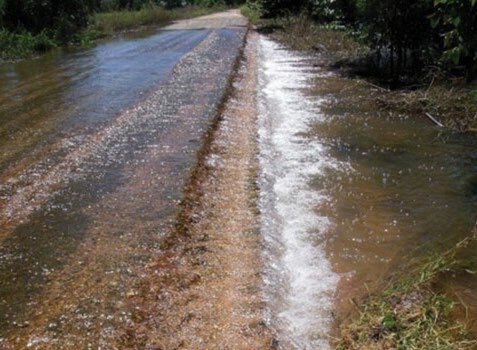 The R52 is a secundary road, between the towns of Lichtenburg and Koster. 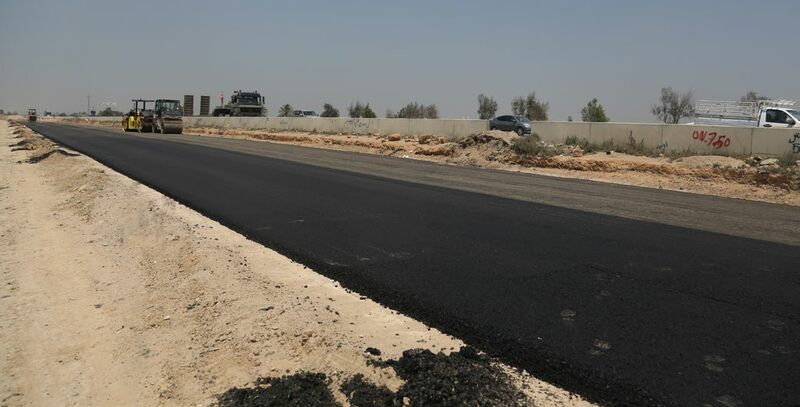 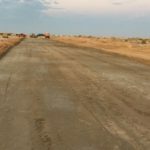 The project basically consisted of widening and structurally rehabilitating the existing road. 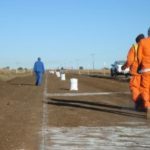 The complete rehabilitation project was executed with RoadCem, mixed with the existing basecourse and finished with an asphalt wearingcourse. 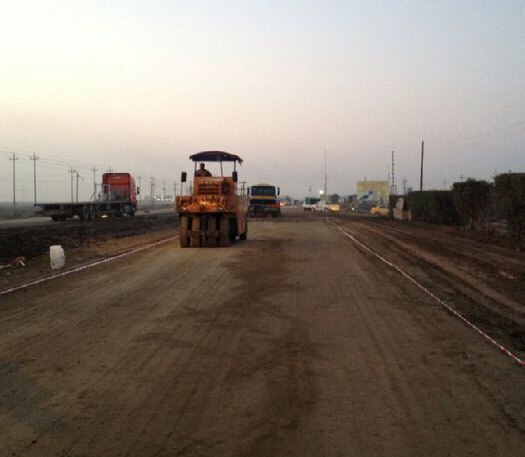 The client choose for RoadCem based on quality, price and huge time saving. 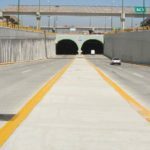 Constructed with the purpose of resolving the complicated vehicle mobility around the crossing located at the “Nueva España” peripheral freeway, the Charo highway, and access to the Industrial city. 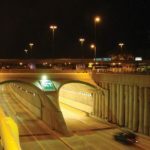 It is also one of the main accesses to the city downtown, wherefore the vehicle capacity in this area amounts to an average of 35 thousand vehicles per day. 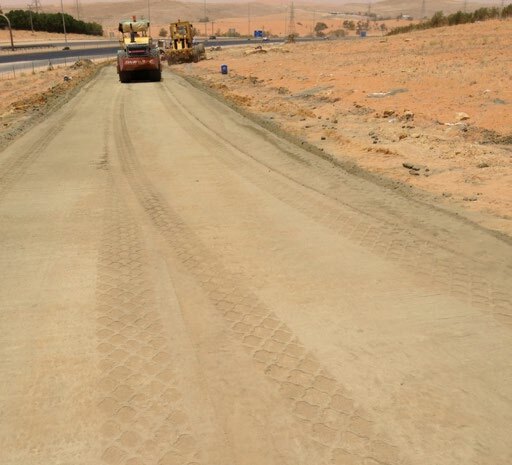 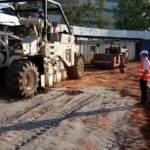 Thanks to the excellent properties of RoadCem, the “Ministry of Communications and Transport” (SCT) included in the construction process the use of RoadCem as an innovative solution by substituting piles by a foundation slab, dirt roads and hydraulic concrete works. This project ranked third in the infrastructure category of the CEMEX projects award in 2010. 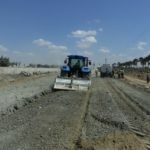 For the extension of a roundabout, which is part of the N279, RoadCem stabilization turned out to be the best solution. 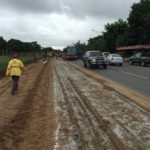 It was of great importance that the flow of traffic be guaranteed during implementation. 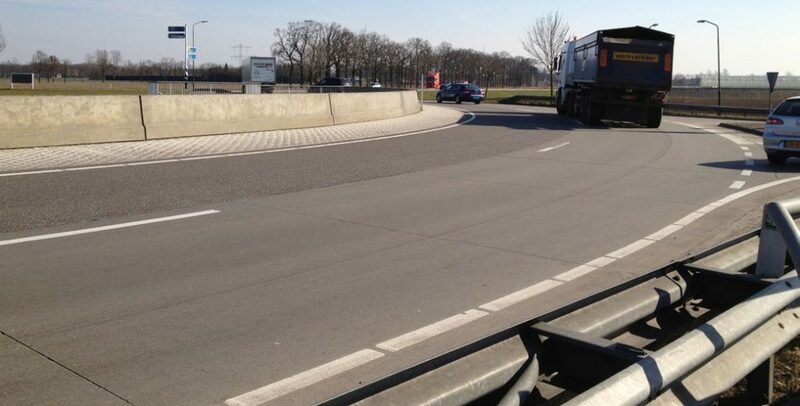 After the completion of the stabilization asphalt was applied and the roundabout was ready for use. 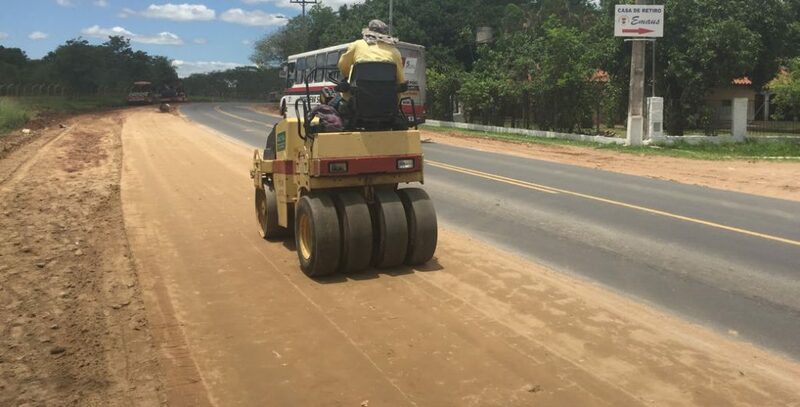 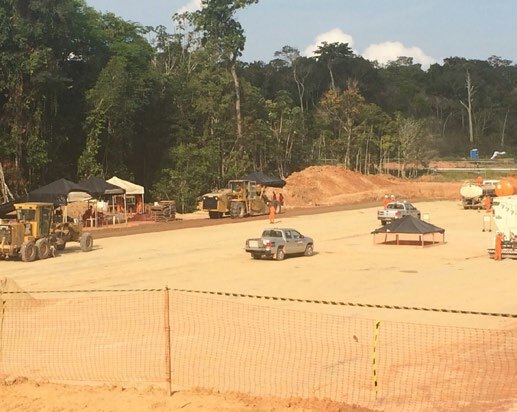 Since 2008, PowerCem Mexico has completed projects for municipal roads and highway sections in Tabasco for the “Ministry of Communications and Transport” (SCT) and for the “State Board of Roads”. 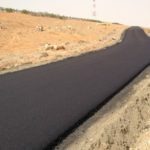 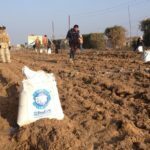 Follow-up has been given to projects in which RoadCem was used. 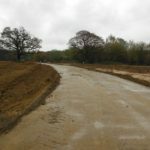 After major flooding, roads constructed with RoadCem stayed in excellent conditions, despite undercuts and corrosion by floodings. As result the “Office of Coordination of Projects and Supervision of Federal Roads”, has extended a wide recommendation for RoadCem to be applied in projects throughout the national territory. 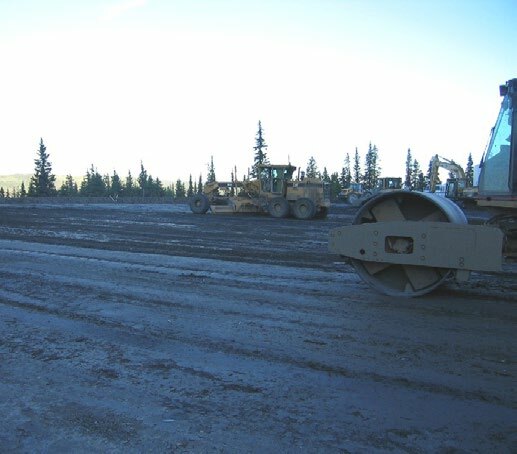 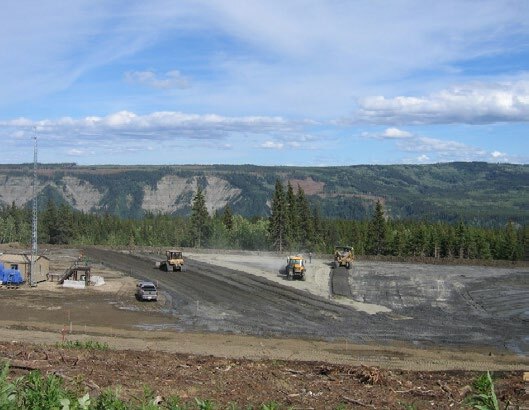 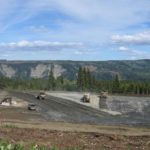 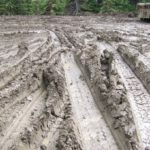 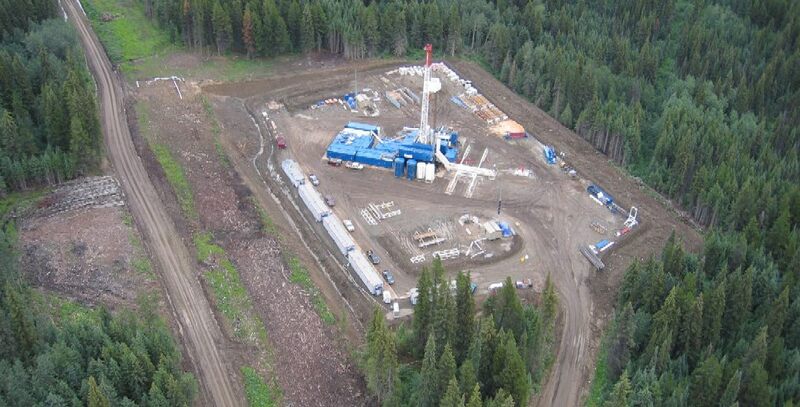 “Shell Canada” was challenged with a location on Chinook Ridge Southwest of Grande Prairie, Alberta (Canada) where road bans were in effect and aggregate was in short supply, rainfall caused the local clays to loose load bearing capacity and or where matting costs were prohibited. 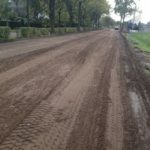 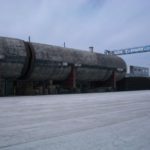 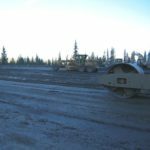 The product RoadCem makes it possible to custom design mixes combined with fly ash, cement and in-situ soils of virtually any type eliminating the environmental impacts. 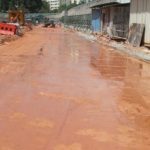 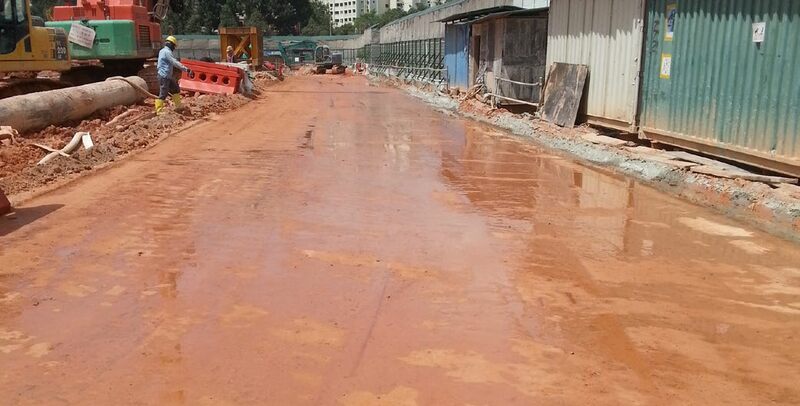 RoadCem construction is water impermeable so pollutions on top of the stabilization are not able to penetrate in the soil. The normative loads on top of the construction are heavy reachstackers with an axe loads of 100 ton, loading and unloading containers and other heavy materials. 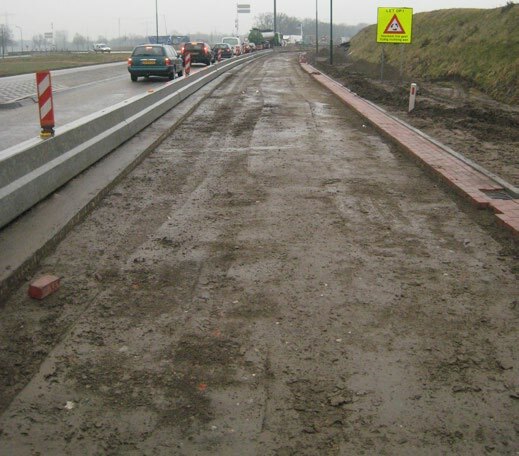 The stabilization was made without any joints. 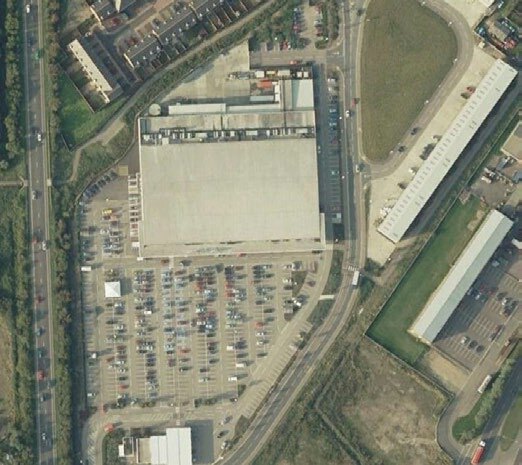 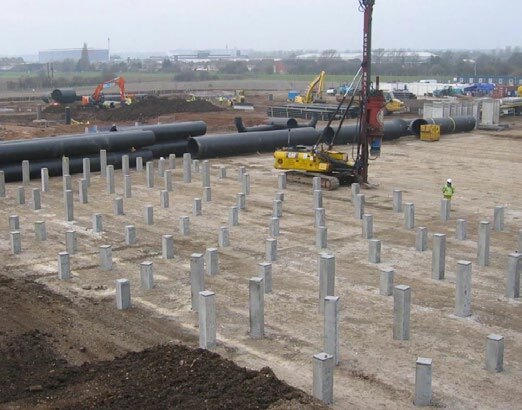 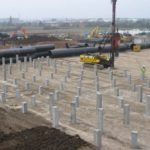 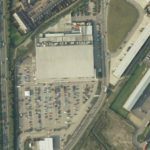 The project was executed with a local British company on behalf of TESCO Superstores at Great Yarmouth, Norfolk, England. 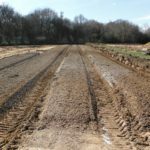 The topsoil was found to be highly organic, with rootlets or made ground consisting generally silty sand, with gravel, cobbles, quartz, wood, ash, rubble and also peaty and soft clayey materials. 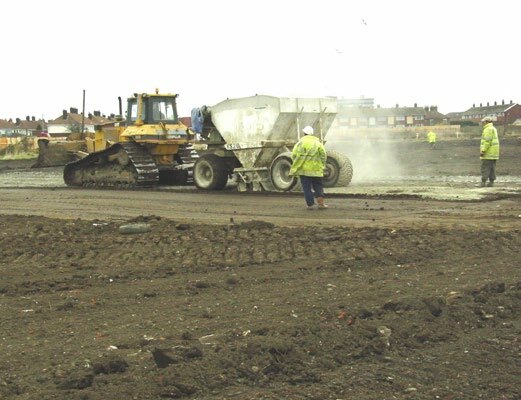 A part of the process of undertaking preliminary site investigations, trials were conducted (September 2001) to assess the potential use for various forms of ground/soils improvement techniques, to determine the most appropriate method to apply to the infrastructure construction of floor slabs to building areas, and to external pavements, car park and hard standings. 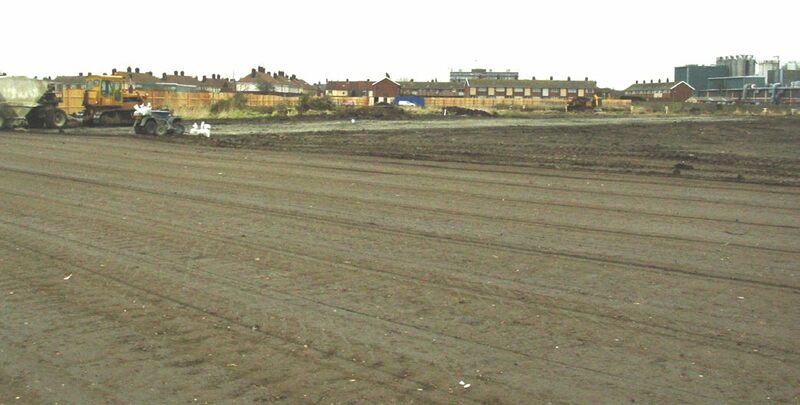 The highly organically and heterogeneous soil was turned into a monolithically non frost susceptible material. The El Dorado International Airport is located 9 miles West of the city of Bogota, and serves the entire metropolitan area in Bogota and the country for international flights. 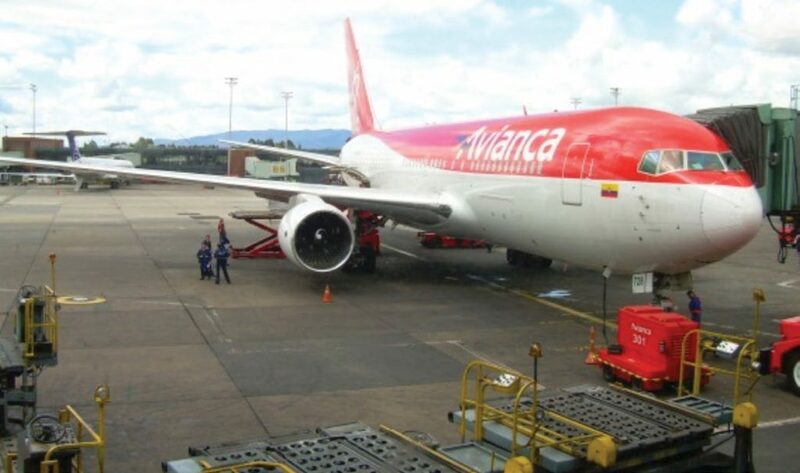 It receives flights from North and South America and the main cities in Europe. 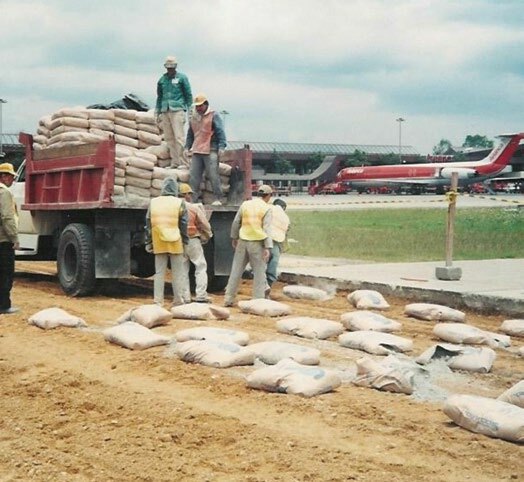 Furthermore, it is the most important cargo airport in Latin America, and has one of the longest landing strips in the world. 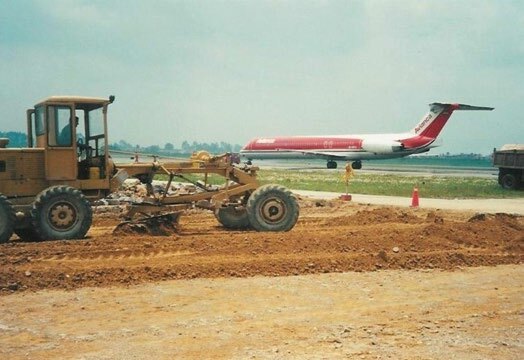 In this airport, PowerCem Technologies participated in the construction of taxi strips in May 2000. 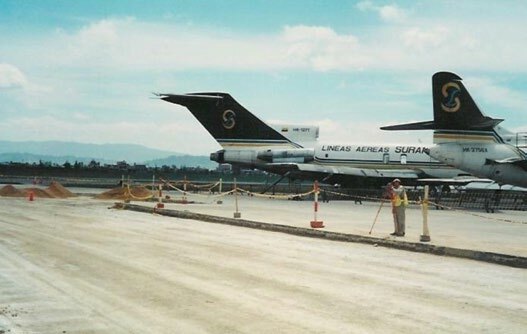 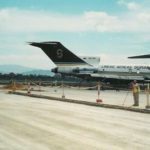 The Aircrafts that serviced as design bases were the McDonnell Douglas MD-83 with 72.4376 Ton (160,000 pounds) in weight, with 200,000 repetitions throughout the expected service life.